Better late than never, right? Sorry about the delay; I meant to post this on October 3, the day of the Mid-Autumn Festival. The Mid-Autumn Festival, also sometimes known as the Moon Festival, is celebrated on the autumnal equinox of the solar calendar, and is the Asian version of a harvest celebration. Traditionally, families celebrate the moon by eating moon cakes – dense, high calorie pastries traditionally filled with a lotus seed paste and a bright yellow yolk from a salted duck egg that symbolizes the moon. Lotus paste is the most common filling, but nowadays you can usually find red bean paste and taro fillings. I’ve even seen coconut paste and green tea fillings, among others, in recent years. 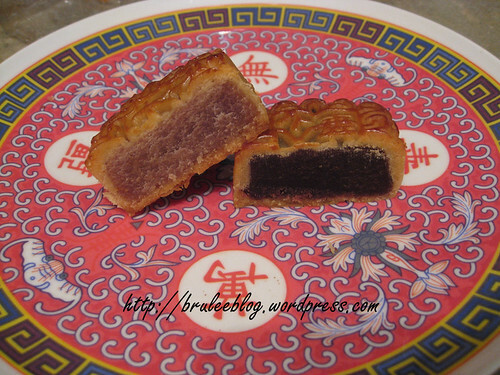 You can also buy moon cakes without yolks, or with one to four yolks inside each piece. This year, I was excited to find two different brands selling low sugar and lower calorie moon cakes being sold at T & T Supermarket. One brand was from Hong Kong, and the other was from T & T’s own bakery. 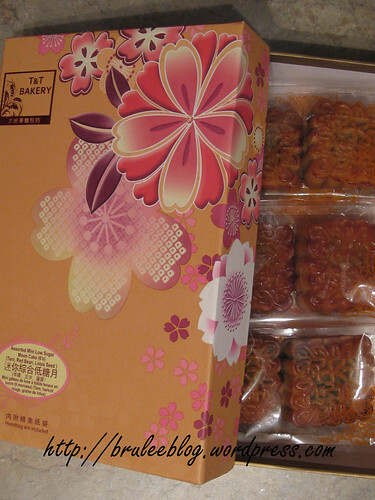 The package I picked up contained 6 mini moon cakes without yolks, and made up of three different flavours – two lotus seed moon cakes, two filled with red bean paste, and two taro moon cakes. How did they taste? Well I found them to be dry. Not sure if that was due to them sitting in the box for too long, or if it was because to reduce the amount of sugar and calories they had to cut back on some of the ingredients that usually make moon cakes somewhat moist and even a bit oily. And normally I don’t care about the yolk but for some reason this time I was craving a bit of the salty bite that usually comes with moon cakes. I think next time I will either try the more expensive brand, or stick with the regular kind of moon cake and just eat less of them.